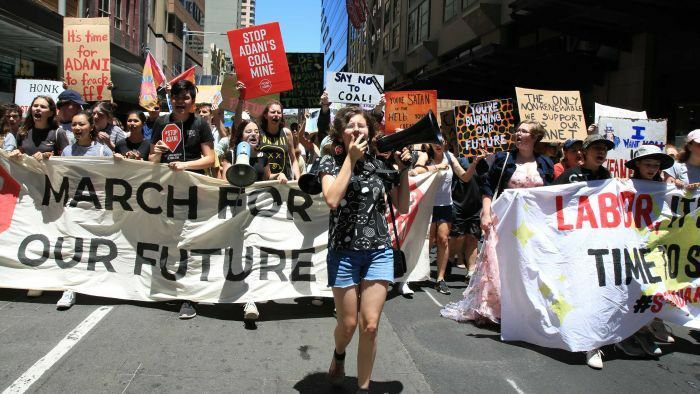 Some of Sydney’s most exclusive private schools are throwing their support behind students choosing to attend today’s climate change rally, with some pupils encouraged to “become the changes they seek to see in the world”. The event, which is being held at Sydney’s Town Hall today, is expected to be one of the largest rallies in the nation, with thousands of students registered to attend. The planned rally has sparked controversy, with one conservative commentator yesterday telling the ABC some students were “barely literate or numerate” and victims of “politically correct teaching”. Meanwhile, NSW Labor Michael Daley encouraged students on Wednesday to skip school and attend. At Baker College, an exclusive Upper North Shore Anglican school, headmaster Phillip Heath said about 40 of the school’s global studies students, members of the school sustainability group Footprint, and two staff members would be attending. “As a school we are supportive of providing for student voices and [we] support their passion about policies and decision-making,” he said in a statement. “We have encouraged all of our students to foster vision and not blame, to become the changes they seek to see in the world. “It is student-led change — global issues considered from a local perspective. Tara Anglican School for Girls in North Parramatta and the Catholic Santa Sabina College were also sending contingents to the rally. St Andrews Cathedral School said Year 10 to 12 students were able to attend if they had parental permission. It said Year 7 to 9 students could go with their parents. St Catherine’s in Waverley and Monte Sant Angelo in North Sydney said they were aware students were going to the rally but had not organised any school support. But Cranbrook School in the Sydney harbourside suburb of Bellevue Hill said while it “encourages breadth of thinking” and assisted students to determine and share their thoughts and understanding of a range of important issues of public interest, “standard school attendance policies applied for all dates within the school term, including tomorrow”. The Department of Education said all students at government schools were expected to be in the classroom. “Any student not in class will be marked absent,” a spokesman said. But a number of schools such as Fort Street High School and Newtown High School of the Performing Arts in Sydney’s inner west sent out permission slips for parents to allow their children to leave school early. Danielle Villafaña-Pore, a 15-year-old student at Fort Street, is set to speak at the rally. “I think climate change is the single greatest threat to our generation and the generations before us,” she said. “And I see it as something that I owe the future generations too because I can’t tell my kids that I stayed silent. “We needed permission from our parents, of course. We can’t just have our parents not know where we are and that was really the only permission we needed. Premier Gladys Berejiklian criticised Opposition Leader Michael Daley, who has backed school kids planning to protest. “I encourage young people to feel passionately about important issues including climate change,” she said. “But to suggest that they should strike during school hours is grossly irresponsible. I want to encourage students during school hours to express their views, to discuss their views in the classroom or the playground. “But to take time off to go to a protest is not acceptable. Mr Daley stood by his comments yesterday. “I’m not encouraging children to skip school,” he said. Ruby Walker, 16, from Inverell High School, said she was passionate about environmental issues that had affected her local area. “A lot of the farmers are really struggling, and where I am, Tingha had some really bad bushfires,” she said, adding that one of her friend’s houses burnt down. “The recent fish kills in the Murray-Darling have only made me more passionate about wanting to strike.